I think one of the big reasons that I picked up The Stand, at least when I first ever got it, was because Gary Sinise was one of the actors in the mini-series adaptation, and I was deep in my fan-girl phase. Some girls have Leo DiCaprio or Brad Pitt as their celebrity crushes, and Gary Sinise was one of mine, you don't get to judge. Anyway, shallowness aside, I still wanted to read the source material before I sat down in front of the mini-series. The first couple tries ended with me putting The Stand away and resolving to return another time. It's not that I wasn't enjoying it, I like Stephen King as a writer. 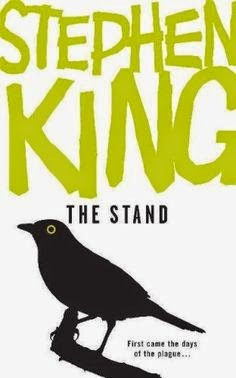 But King is an author that I am a self-confessed fan of, yet whose novels I rarely finish the first time (not counting short stories); as of yet, Carrie is the only one of his novels that I've completed first try. And I can never figure out why. I guess that was my main motive for picking up The Stand this time: find out what it is that makes me keep faltering. The Stand follows a group of survivors after a weaponized strain of the flu is accidentally released into the world, killing 99.4% of the population in a matter of weeks. In the wake of this devastating plague, the survivors are beset with two startlingly similar reoccurring dreams. The first involves the figure that many call the dark man, a figure that simultaneously terrifies them whilst also offering the dreamer the fulfillment of their darkest desires. The second involves an immensely old black woman going by the name Mother Abagail, inviting them to her home. Two communities start to form as people gravitate towards these opposing forces and conflict seems close on the horizon. Oh boy, I'm sure I could talk about this book for absolutely hours on end. Partially I guess that's because there's just so much in there to talk about, seeing as it was King's longest novel by quite a margin until Under the Dome was published (if I remember correctly anyway). And, bar a few things that are more niggles than anything, I can't actually think of anything major that I disliked about this novel. The characters are engaging, ranging between the genuinely creepy (Randall Flagg and Trashcan Man), the infuriating (Larry Underwood), the too good for this earth (Nick Andros, be still my beating heart) and everywhere in between. The narrative morphs from a tense account of the last days of humanity in its current form and the way that the government (at least in the United States) tries to brutally suppress any and all information about their mistake leaking out, to a spiritual journey in which the last dregs of society take sides in an honest-to-God conflict between good and evil. In the later stages there are a few deus-ex-machina moments as the plot begins to come to its close, but they are they only ones that I have seen that are simultaneously this blatant and yet completely in keeping with the tone. If I had known quite how strong the religious allegory would get towards the end, I'm not sure what kind of outlook I'd have taken with me; if I'm honest, religious overtones leave me a bit dubious considering how preachy they can get. Overall though, while the action can get seriously Old Testament at times, the actual message seems to be that goodness will get humanity through the hard times despite the additional suffering that happens along the way. If I'm perfectly honest though, The Stand won me over by having not one but two fantastically written disabled characters. Nick Andros and Tom Cullen were a breathe of fresh air and I wish that there were more characters like them. I did have a couple issues with their characterisation at times, but honestly I adore those two so much that I couldn't really dwell on them for terribly long.